The Compton originally came from the Picture House Douglas on the Isle Of Man and was opened by William Winder-Killip in 1933. During its time on the Isle of Man, it was played by several local organists. One of particular note was Haydn Antrum who appears to have played the organ regularly into the 1940s. By the 1950s the organ became redundant and was removed following the installation of a new, wider cinema screen. 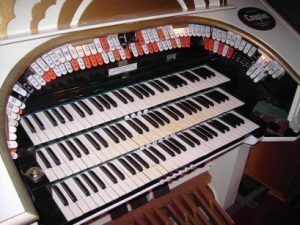 It was at this point the organ was purchased by Ron Curtis for installation at Gorton Evangelical Church in Manchester. Here, several ranks of pipes were swapped and its percussions removed. Interestingly, the pedal board was never connected! 1988/9 saw its installation at The Grange by Steve Tovey, since which time the percussions have been returned. Recently, a Double String has been added. Since then, improvements have been made to the instrument and many guest organists have played there.